As a result, the Foreground color of the custom header does not change on mouse hover (Figure 1 ), sorting, etc. 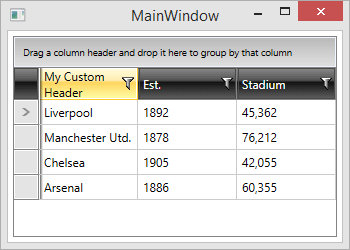 Figure 1: The Foreground color of the custom header does not change, when the column is hovered. Your custom header is not automatically bound to the default theme's Foreground color. You can bind the Foreground property of the custom header(in this example this is a TextBlock) to the Foreground property of the control containing the content of the GridViewHeaderCell(Example 2 ). In this case the container is a ContentControl with x:Name="ContentPresenter", which is located in the default GridViewHeaderCellTemplate. You can observe the result in Figure 2. Figure 2: The Foreground color of the custom header now changes, when the column is hovered.